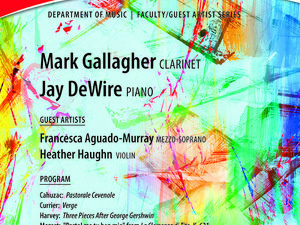 The Frostburg State University Department of Music will present clarinetist Dr. Mark Gallagher, pianist Dr. Jay DeWire, mezzo-soprano Francesca Aguado-Murray and violinist Heather Haughn in a Faculty-Guest Artist Series concert on Sunday, Nov. 4, at 3 p.m. in the Pealer Recital Hall of FSU’s Woodward D. Pealer Performing Arts Center. The recital is free and open to the public. The program will include “Pastorale Cévenole” by Louis Cahuzac, “Verge” by Sebastian Currier, “Three Etudes on Themes of Gershwin” by Paul Harvey, “Parto, parto, ma tu, ben mio” from “La Clemenza di Tito, K. 621” by Wolfgang Amadeus Mozart and “Six German Songs, Op. 103” by Louis Spohr. French composer Cahuzac was one of the few clarinetists who made a career as a soloist in the first part of the 20th century. “Pastorale Cévenole” radiates with the Mediterranean light of his beloved southern France and echo-type effects suggest open, mountainous spaces. Composed in 1997 for the Verdehr Trio, who commissioned and recorded it, “Verge” is one of Currier’s best-known and most often played pieces. The instrumental writing is often delicate and fastidious. Each of the nine brief movements is on the “verge” of some state, and except for the last movement (“almost too calm”), the movements are in contrasting pairs. “Three Etudes on Themes of Gershwin” – “I Got Rhythm,” “Summertime” and “It Ain’t Necessarily So” – were written for three different clarinetists. “La Clemenza di Tito” (“The Clemency of Titus”) is an opera seria in two acts composed by Mozart to an Italian libretto by Caterino Mazzolà, after Pietro Metastasio. The work premiered in 1791 in Prague. In “Parto, parto, ma tu, ben mio,” one of the opera’s most famous arias, after Servilia orders Sextus to kill his friend Titus and set fire to Rome, Sextus meekly acquiesces and sings that he will do anything for Vitellia’s beauty and love. Spohr was a German composer, violinist and conductor who composed “Sechs deutsche Lieder” (“Six German Songs”) in 1837. Spohr’s compositions for clarinet, with their long beautiful melodies and virtuosic tendencies, were in many ways influenced by his background as a violinist, and these songs are no exception. Gallagher made his New York recital debut performing with violinist Sylvia Rosenberg at Lincoln Center's Alice Tully Hall and is a winner of the Artist International Competition in New York City. An active chamber musician and co-founder of I Venti Semplice, he has performed throughout the United States, Europe and China, with recent concert tours of the Netherlands and performances in Beijing and Changsha, China. Gallagher has recorded with the Albany Records label and can be heard on the Eastman “American Music” Series. He is an associate professor of music at FSU. DeWire has performed across the United States as a soloist, collaborator and member of the West Shore Trio. Highlights include two performances as soloist with the Prince George’s Philharmonic and concerts in Chautauqua, Los Angeles and New Mexico with the West Shore Piano Trio. DeWire has also received numerous prizes, including the Brander Wyatt Morrison Prize, and a Dean of Faculty Fellowship from the University of Virginia. He teaches piano and history at FSU. Aguado-Murray has been praised for her solid mezzo sound and excellent support and for her voice’s confident precision and articulation. She joined the Maryland Symphony Orchestra for the 2015-2016 season to bring life to the title role in Bizet’s “Carmen” and this season will make her debut with Miami Lyric Opera in its production of “Cavalleria Rusticana.” In addition to an active performance schedule, Aguado-Murray maintains voice studios with Mount Saint Mary’s University, Hagerstown Community College and the Barbara Ingram School for the Arts. Haughn, also a member of the West Shore Trio, enjoys a diverse career as an active chamber musician, orchestral player and teacher. She plays with the Annapolis Symphony Orchestra, Concert Artists of Baltimore, Delaware Symphony Orchestra, Maryland Symphony Orchestra and the National Philharmonic. She is on the faculty of Goucher College and the Duke Ellington School of the Arts. Haughn has performed as soloist and concertmaster with the Berkeley Symphony Orchestra, the San Francisco Sinfonietta and the San Francisco Concerto Orchestra.